4 years ago a girl came up to me at a church conference and asked me “are you by chance Cluck Cluck Sew?”. Now she’s become my best friend and I’m so glad this blog helped me meet her! Plus our husbands became instant friends…how lucky is that?! She’s having a baby girl next month, and baby will be sharing a room with her older sister who has lavender and aqua decor already. 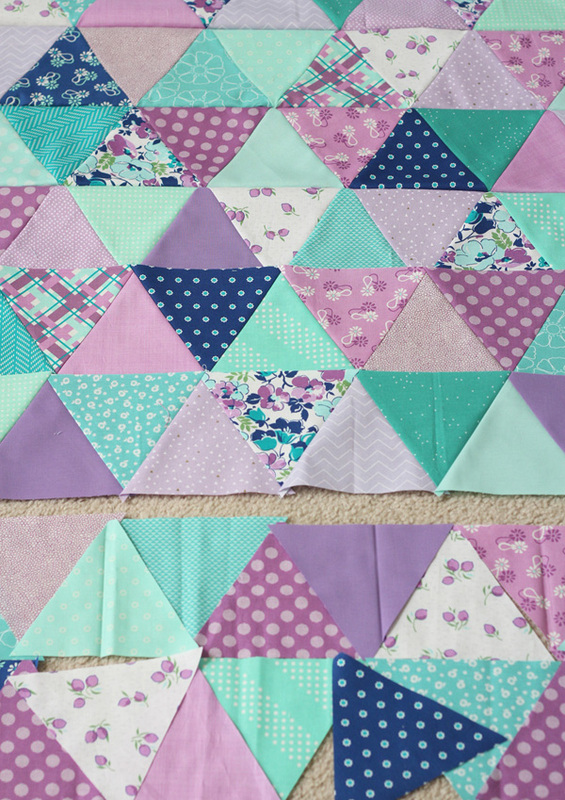 Most of the purples in this quilt are from my Hello Jane line (coming in a few weeks or less I think! ), and I added some lavender prints. I’ll do a post with some coordinating solids like these for Hello Jane soon. Different shades of purple mix so well together like the blues do…I love the violet next to the lavender. I used this 60 degree triangle ruler and cut my starting strips 5 1/2″ x width of the fabric, then cut my triangles from the strips using the 5 1/2″ mark on the ruler. I really like this size of triangle for a baby quilt. I think this one measured about 45″ x 50″ when I was done. I didn’t count out my triangles as I cut them…I just cut and cut until it looked like enough and laid it out the size I wanted. I put a lavender minky on the back, and I used basting spray (tutorial here) plus a few pins since I used a slightly thicker batting. I straight line quilted it following the diagonal seams, and machine bound it. I just love making baby quilts…especially when it’s a baby I’ll get to snuggle and hold lots and lots! I’m headed to Quilt Market in St. Louis tomorrow. My suitcases are over-stuffed and have a book to read while I enjoy a plane ride ALONE. :) If you’ll be there I’m in booth 2231…I’ll do a recap on the blog next week! What a beautiful quilt. Love the aquas and lavenders, such a pretty combination of colours. 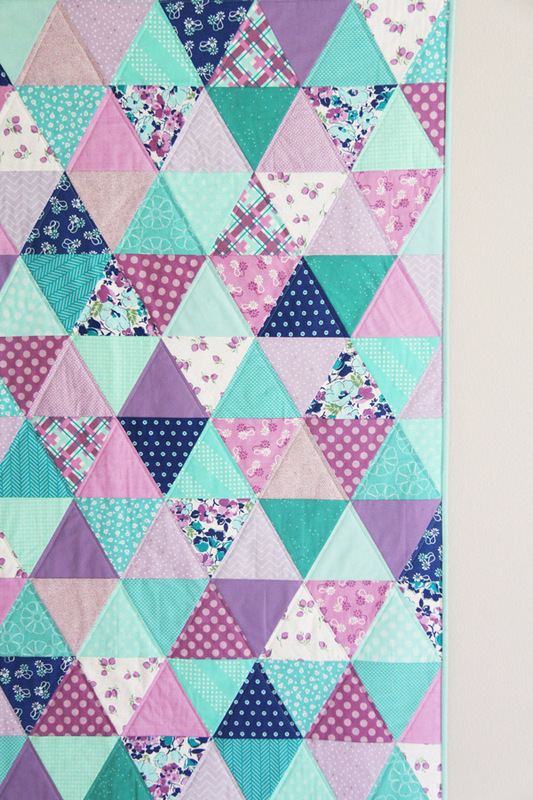 I’m not usually a fan of triangle quilt designs but your lovely colours have made me change my mind! Hope your forthcoming trip goes well. I love your color choices! Beautiful! This is absolutely beautiful! Love the purple! 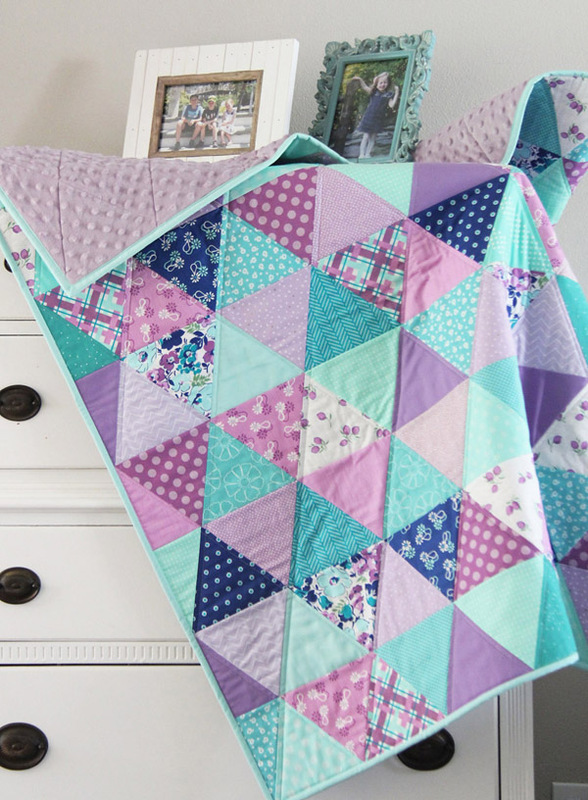 Love this quilt and the aqua’s and lavenders you used in it. My oldest has been eyeing your fabric release :)!! Have fun at Quilt Market and your lonely – I mean ‘alone’ plane ride :)! What a great color combination! Have a wonderful time at Quilt Market! I love this colour combination. I would never have thought to mix those colours, but I love the look. Love your quilts Kristin! The quilting on them is fabulous! Thanks for sharing! I so love these colors together!!! And the quilts is just adorable :) What a special gift!!! Have fun at Market, I wish I were coming so I could come by and say Hi :) So I guess it will just have to be a Hi from here!! Love this quilt! The colors are beautiful, and that will be such a lucky baby! 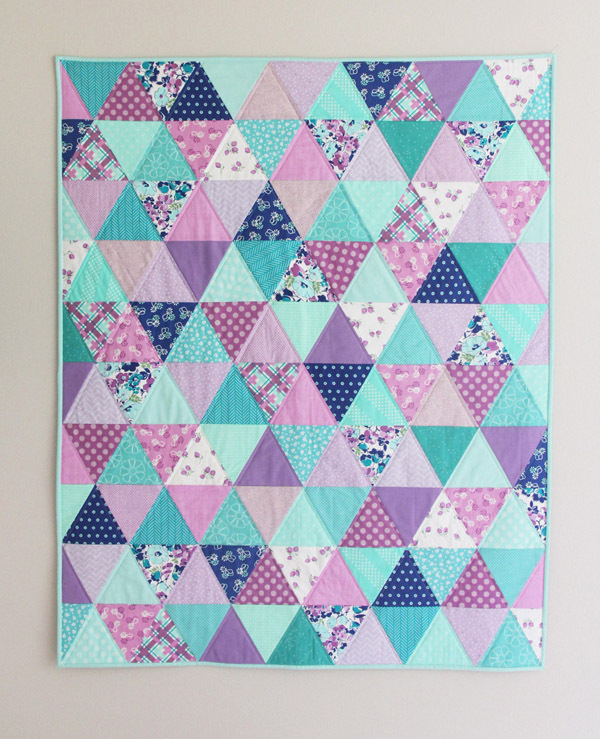 You can’t beat a classic triangle quilt and the colors you used are just beautiful! I love this quilt, the colors are awesome. Thanks for sharing……….. Safe travels and have fun at quilt market ! 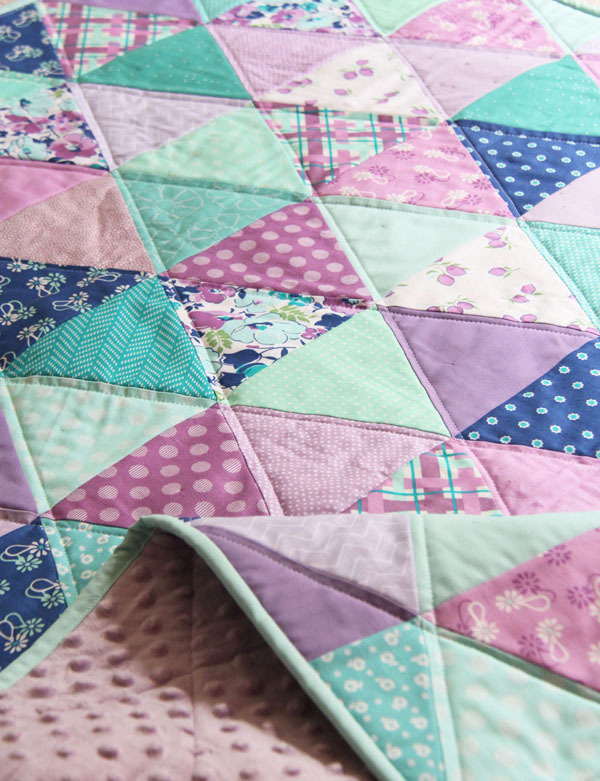 I love this quilt…so soft and pretty!! I also like the quilting that you chose. Great job! It’s just beautiful, the friendship and the quilt. It’s a beauty, obviously stitched with love! Wow! I really, really like this quilt! I almost never use purples but this makes me really want too!! So pretty!! This quilt is adorable!! I’ve never made a triangle quilt — but this would be a fun one to try!! Thanks for explaining how you cut the triangles… sounds pretty easy! Like Vanessa (above) I too am not a fan of lavender ~ never have been! (long story from my college days… and a date that fizzled along with the horrible lavender dress I made to wear on it!!!) …but your lavenders mixed with the aqua and darker blues are so pretty! I might become a convert!! grin. 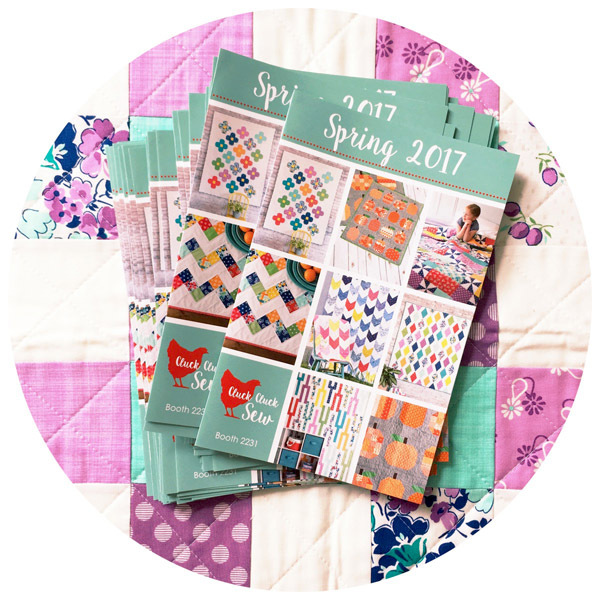 Love, love, love your baby quilt! 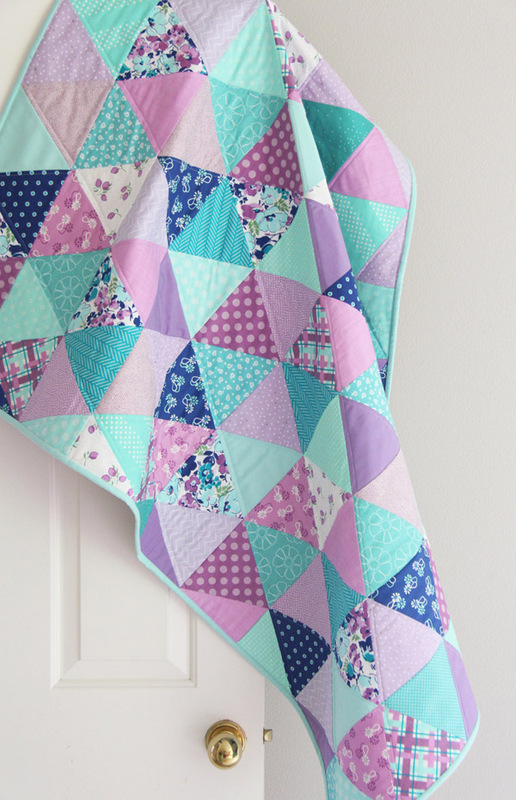 I wanted to try a triangle quilt and have often thought that lavender and aqua would be beautiful together. Now I know for sure. Thanks for the inspiration. this is a really beautiful quilt!! Oh I love that quilt so very much! Those fabric colors are just gorgeous together!! Wow! Thanks so much for sharing with us. I just love your new fabric line. I’m going to purchase lots. I’ve never liked purple, lavender in a print or solid. Paired with aqua , I know love it. I love all your patterns and will be purchasing yet another!!!!! You are a blessing! Thank you Dana…I felt the same way about purple and now I can’t seem to get enough! Thank you for visiting! Gorgeous quilt! And yes, when husbands become best friends, too, super lucky, indeed! Just got a lewsletter from Hawthorn Threads: Hello Jane is now available!!!! Yay!! You knew before me! I didn’t know it shipped yet….yay!! 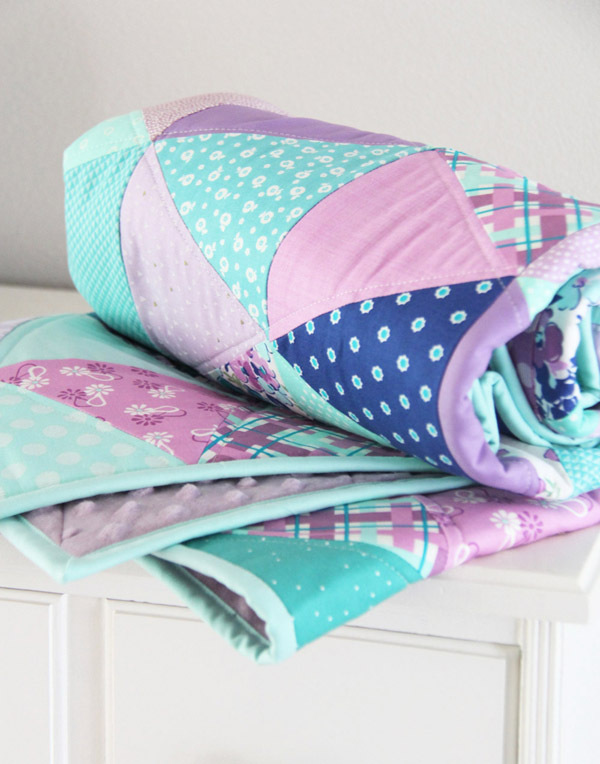 Love love love this quilt and the colors! I want to make one, would I be ok buying 1 yard of each to cut the triangles from?